Unspoilt diving: While the explosion in popularity of holidays in the north of Egypt (such as Sharm el Sheikh and Dahab) has resulted in a great choice of facilities, the downside is that diving can be rather busy there. As a result, the incredibly delicate corals run the risk of being damaged. Holidays to the less well-known (and built up) resort of Marsa Alam have no such problem, and the reefs here are some of the most beautiful in the world. Seemingly untouched by tourism, the Red Sea plays home to a wide variety of fascinating large marine creatures. Sunshine holidays: Being close to the Tropic of Cancer, Marsa Alam holidays enjoy glorious weather conditions all year round. The temperature hits highs of 35C in the summer and a pleasant 23C in the winter. With only 6mm of rainfall a year and almost 4,000 hours of sunshine a year, you’re virtually guaranteed cloud-free skies whatever time you visit. 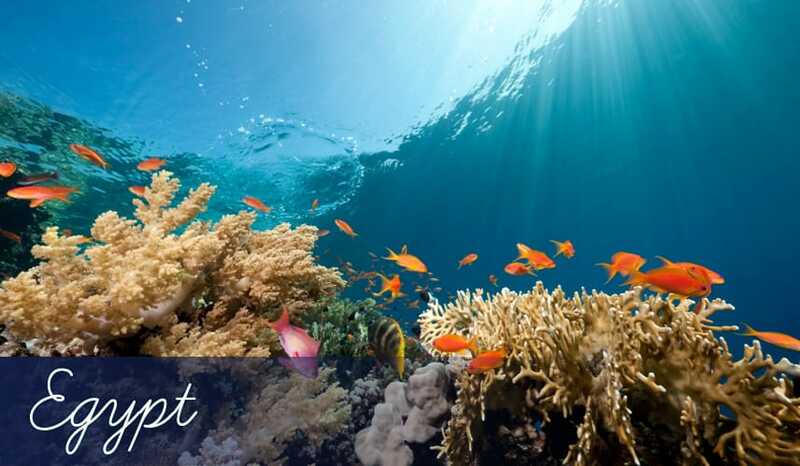 Diving & Snorkelling: Marsa Alam holidays have not yet experienced the surge in tourism associated with places like Sharm el Sheikh. This is by no means a bad thing, as the water around here is relatively undisturbed. As a result, you’ve got a better chance here of spotting large and rare marine animals than anywhere else in Egypt. The most interesting animals to look our for must be the dugong (or ‘sea cow’ as it’s often known) and the extremely rare guitar shark. Marsa Abu Dahab is one of the most popular dive sites on holidays to Marsa Alam because it’s here you’re most likely to see the dugong. This inquisitive, unusual and friendly creature has the face of a dog yet the body of a dolphin, and it’s truly an amazing experience to swim with one in the wild. It’s a similar story for the guitar shark, which is one of the rarest sharks in the world. It has a flat body like a manta ray but long, spiky fins. You may also have a chance to spot these in the Elphinstone reefs where large white tip sharks also lurk! Carnelia beach: Marsa Alam holidays have some of the most beautiful beaches in Egypt. They’re never crowded, even during the high season, and they generally consist of soft golden sand on open expanses. Carnelia Beach is one such example, and the thatched parasols and bungalows only add to the traditionally rustic atmosphere. Gorgonia beach: This open expanse is very similar to Carnelia. The thatched parasols are out in full force here too, but the sand here is a little coarser and darker. One great thing about beaches in Marsa Alam is that you can actually wander into the shallow waters from the coastal edge. In most beaches in Egypt, rocks and corals begin instantly at the coastline so you have to walk along wooden jetties to reach the deep sea. Abu Dahab beach: This beautiful public beach is one of the most popular on holidays to Marsa Alam, and it’s easy to see why. The fine white sand is a real pleasure to walk on, and again, it’s another one of those beaches in Marsa Alam where the sand leads directly to the water. You can hire sun beds and thatched parasols and enjoy your own little slice of this sandy paradise. Cacio e Pepe: Marsa Alam holidays are still relatively quiet, and most of the restaurants here are connected to the many all inclusive hotels. So it’s refreshing to see this independent Italian in the centre of Marsa Alam. Translated directly as ‘Cheese and Pepper’, this authentic restaurant offers a variety of pizza and pasta dishes. It’s also one of the best places to enjoy an espresso! TGI Friday’s: Although still in the process of being built-up, Marsa Alam holidays do already have a number of branded restaurants. The world-renowned TGI Friday’s has a restaurant in Marsa Alam, and you can expect all the classic American flavours from the menu, like Cajun chicken, Jack Daniel’s steak and dipping platters. Pizza Hut: Near to Port Ghalib, Pizza Hut is another famous restaurant chain in Marsa Alam. You can expect all the delicious favourites here, including pepperoni, lasagne with a chewy mozzarella topping and the famous full house. Partying holidays: Despite having a fairly small town centre, there are still several bars in Marsa Alam, particularly around the tourist and hotel area. There’s the Mexican-themed club Ciao Marsa, which plays latin music until the early hours. Plus there’s Planet Bedouin, which offers a relaxed experience enjoying drinks under a traditional tent on the beach. You could even partake in some flavoured sheeshas while you’re there, and there are weekly belly dancer shows too! Unique products: Marsa Alam is only a small town, but there’s still ample opportunity to discover some original items which are uniquely Egyptian. Look out for the richly scented perfumes. Because they’re oil based, their fragrance is much more powerful and lasts longer than the alcohol based ones that are common in Europe. Aside from that, there are a number of beautifully crafted Bedouin items, such as straw hats, ornaments, baskets and scarves. These have been created by local Bedouin people so it’s fair to say you won’t find them anywhere else! Spices and herbs are also of exceptionally high quality in Egypt, largely because the climate is perfect for growing most of them. Look out for the stalls selling a vibrant and enticing variety of spices – they’re all at fantastically low prices ensuring you won’t need to bring too much spending money on cheap holidays to Marsa Alam!